Last modified on Wednesday, May 2 2007. 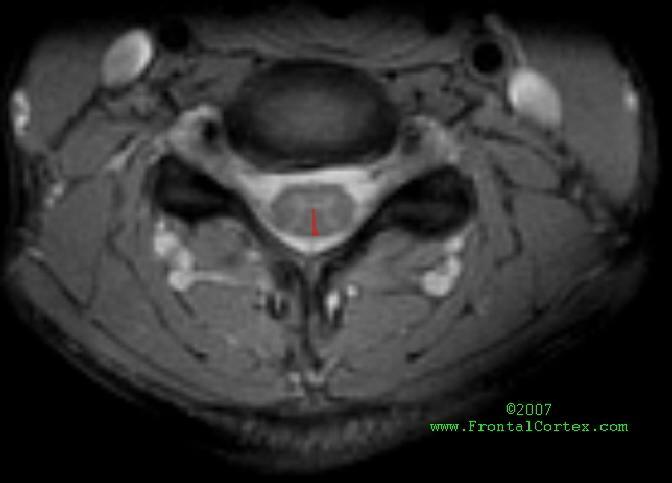 The T2 MRI above shows healthy spinal cord at the C6 level. Which of the following statements is most accurate about the area highlighted in red? This question was created on May 02, 2007 by jdmiles. This question was last modified on May 02, 2007. 1. Moore, K.L. (1992). Clinical Oriented Anatomy, 3rd Edition. Williams & Wilkins, Baltimore. 3. Nolte, J. (1993). The Human Brain: An Introduction to Its Functional Anatomy. Mosby, St. Louis.